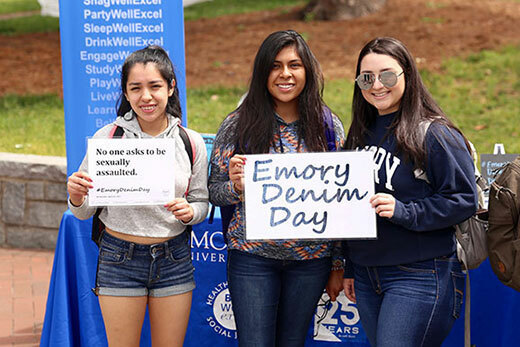 The Emory community is invited to wear denim on Wednesday, April 18, for Denim Day, an annual event intended to show support for survivors of sexual assault and ending sexual violence. Denim Day is an initiative of Emory's Respect Program, which seeks to support survivors and raise funds for the program, which serves as a central hub for sexual and interpersonal violence prevention programs, as well as efforts to create a more survivor-supportive and safe campus community. To show visible support, everyone is encouraged to take photos of themselves and others wearing denim and send the photos to the Respect Program at respect@emory.edu. You can also tag the Respect Program on social media through Facebook (Emory University Respect Program); Twitter @RespectWell; and Instagram @Respect_Program. After following or tagging, use #EmoryDenimDay to ensure the photos can be seen by the program. The Emory Student Government Association (SGA) will donate $1 for every Denim Day photo received by the Respect Program. Funds raised will be used to support Respect Program initiatives, including prevention education, trainings and outreach for faculty and staff, as well as advocacy and direct support for those impacted by sexual violence. “We would encourage anyone within the Emory enterprise to participate and show their support for those who have been impacted by interpersonal violence,” says Michele Passonno, assistant director of the Respect Program. Participants may also request Emory Denim Day buttons and stickers for their classroom, office, department or organization, notes Passonno. Those interested in receiving materials should email respect@emory.edu before Tuesday, April 17. Emory Healthcare employees are encouraged to show support in ways that are consistent with their workplace dress codes. In conjunction with Denim Day, the Respect Program will be sponsoring Wonderful Wednesday and will have tables, informational materials and photo opportunities at Asbury Circle and the Rollins bridge, among other campus locations. The Respect Program offers advocacy services, including a 24-hour support hotline that Emory students can contact for support, accompaniment and/or resources, at 470-270-5360.